A client has a SONY VGC-V2M all-in-one PC. It is like a fat TV – a P4 based motherboard in a black case with built-in LCD, DVD, and all the usual sockets. now Windows will continue to boot. Now is obviously the time to make sure your backups are up to date ! As an aside it is actually easy to upgrade the memory in this all-in-one. You slide the back up a few inches until it catches and then it sort of pops off by moving it back away from the case. How it latches is some locking tabs that fit through gates into a slide so you have to slide the back up until the tabs are aligned at the gates and then it easily pops off backwards. Don’t force it. The memory is under the metal panel on the right hand side (looking from the back). Motherboard has two slots and AFAIK it is 1 GB max of DDR PC3200 400 Mhz CL3 or similar per slot. You probably have 512 MB fitted and running Windows XP so for routine Office use just fit another 512 MB for the cheapest upgrade as Windows XP is now unusable rubbish on only 512 MB but fine on 1GB. Maximum is 2 GB in total i.e. 1GB+1GB. format a USB key using Windows FAT. Probably work with FAT32 but I used FAT. I used an old 1 GByte key but probably any size would work. It does not have to be bootable – just formatted. rename the ZG5_3114.fd to a new file name ZG5IA32.FD (it must be that name). You should now have at least this ZG5IA32.FD file you renamed and the FLASHIT.EXE Note that the file names are case insensitive – this is DOS. Insert the USB key into the left hand USB port on the broken Acer. Hold down the Fn and the Esc keys and then push on the power button as normal keeping the Fn+Esc keys pressed. After all the lights have stopped blinking then it is finished. It should reboot by itself and then it will now be working fine. You will have to reset the date/time. If it still doesn’t work but it still has the power coming on then retry the process above to make sure you are doing all the steps right as this should fix this problem. Client has fixed up an old building and has used solid insulation which has an aluminium foil backing that acts as a heat and vapour block. It also stops WIFI dead. Normally this wouldn’t be a problem and all your signals would be under the roof but this client has a 3-story rustic building with the office at the top and a bedroom at the back on the ground floor with a new roof. Whilst the WIFI signals are fine from the top to the bottom of the main building, immediately you pass under the foil-insulation of the extension then the signals stop. The most cost effective solution to get WIFI to this back room without running Ethernet cables through meter thick stone walls is to use powerline adapters. Recently I have seen the retail prices for these plummet to less than 50 Euros per pair (for TP-Link brand from Amazon.it or Amazon.co.uk). Currently testing these out and they are looking fine but there is one caution that you need to consider. These units give off a high frequency audible noise. It is like the flyback transformer of an old style CRT or TV. From experience with different customers these high frequencies can be annoying and frustrating to remove. So you may need to use powerline technology to sneak through the building and then for the last few meters use a cheap switch plus long pre-made ethernet cables or another WIFI AP. The wire on the temperature gauge of my Aprilia Leonardo finally broke near the socket so the temperature reading stayed on low/no reading. If you look you can see a metal pin on the gauge that the needle sits against. After about 2 minutes of motor operation the needle should move off that pin. If it doesn’t then check that wire. To do this ideally remove the right-hand side inspection panel and the temperature sensor is towards the middle bolted into the engine block around the same level as the starter motor (the oil pressure sensor is much lower). This can both come loose (mine did a year before) or finally snap off at the plug. The temperature sensor has a spade plug end on it so nothing special but you don’t have any slack to play with on the wiring loom so you need an extension wire but I discovered a nice fix that will probably work for you too. Many months ago I had picked up a junk microwave from the road side: I had pulled it apart to see what was inside and I remember keeping all the wiring looms from the microwave. The wiring loom connects all the microwave door interlock switches together to the control board. Looking around for suitable wire to repair the bike I noticed that the microwave loom had these nice sockets with moulded plastic covers and reasonably good sized cable. The cable lengths are only a short distance of a few inches/centimetres but that’s all I needed. I tried one of the sockets fitted the temperature sensor on the bike and it clicked on perfectly. So I chopped off one of the sockets with about 3 inches/8 cm of wire on it, stripped back the end and then stripped back the end of the broken wire on the bike, cleaned the corrosion away and then used a barrel/coupler connector to join the new bit of ex-microwave wire to the bike wiring loom wire. Client PC had some weird problems; could start sometimes, would shutdown, runs “slow” though usually fine. Used CPUID HWMonitor and the SiSoftware sandra to see what’s up and the CPU temperature was high (75 Deg C). The SiSoftware sandra processor reports a CPU temperature which correlates with the HWMonitor TMPIN1. Got this desktop back to base and popped the hood. Cleaned out the usual dust bunnies and then decided to check the CPU seating on the heatsink. This is a socket 478 on an ASRock motherboard so levered the heatsink retaining clip but the heatsink wouldn’t come out and seemed frozen in place. Used a bit of force and when I did get it out the CPU had been pulled out too from its ZIF – the CPU was firmly glued to the heatsink by dry white heatsink compound. I thought of what to get that off – a scalpel would be too sharp and dangerous and not big enough and then I remembered my favourite kitchen knife – the slicing/ham/salmon knife. This is 30 cm long, straight edged (not serrated), thin, about 2cm wide and a rounded tip. I put the knife edge up to where one edge of the CPU and heatsink touched and then applied pressure. The knife broke the glue bond and the CPU was loose. Used the knife to scrape the heatsink clean. Re-assembly was easy, re-inserted the CPU back into its ZIF socket that it had been pulled from (obviously open the locking lever first ! ), added usual thin smear of new thermal grease to the heatsink and put it back though you may have to do this in conjunction with the heatsink retaining clips as the heatsink may need to go in at an angle so the clips can hook into the bracket. Screwed back in fans and powered up. BIOS looked good with a starting reading from cold of 28 deg C then working its way up to 34 deg C. Then ran Windows and now HWMonitor and SiSoftware sandra say 38 deg C and this maxes out to 42 deg C.
That’s up to a 30 degree C drop. Now the system should stay stable. ps: As a safety note clean the knife of any residue. White greases are ceramic based and one important ceramic is Beryllium oxide which is poisonous in a loose form. These are not used for thermal grease now but may have been used in the past and unless you installed the heatsink yourself (in this case I didn’t) you won’t know what the risk is. I’d bought this over a year ago and never really got it working and put it aside as I had got a nanoKEY and a nanoPAD (Black) and just used the nanoKEY. Recently I found this again in the cupboard and thought that I really had to get to the bottom of why it did not go (I was using Ubuntu so blamed that to start with without following it up). I plugged it into my Ubuntu machine (10.10) and used the MIDI monitor in Qmidiroute and only saw the X-Y events – this does pitch modulation, plus the system events for the scene button but not a single event from the 12 PADs. I also plugged it into Windows and used a MIDI monitor and also had no MIDI events for the PADs. This really did seem to be a hardware problem and nothing to do with Ubuntu. I really should have done this test before the warranty expired but this meant I could open it up without any guilt. Under the bottom of the case under the tiny rubber feet are 6 screws. Remove these. You will see a metal plate which is the support for the 12 PADs plus a copper shield, 1 large flexible ribbon cable for the PADs and underneath that 1 small flexible ribbon cable for the X-Y control. These plug into a PCB. With it plugged into the USB and with the MIDI monitor program going I checked I had X-Y events and no PAD events. 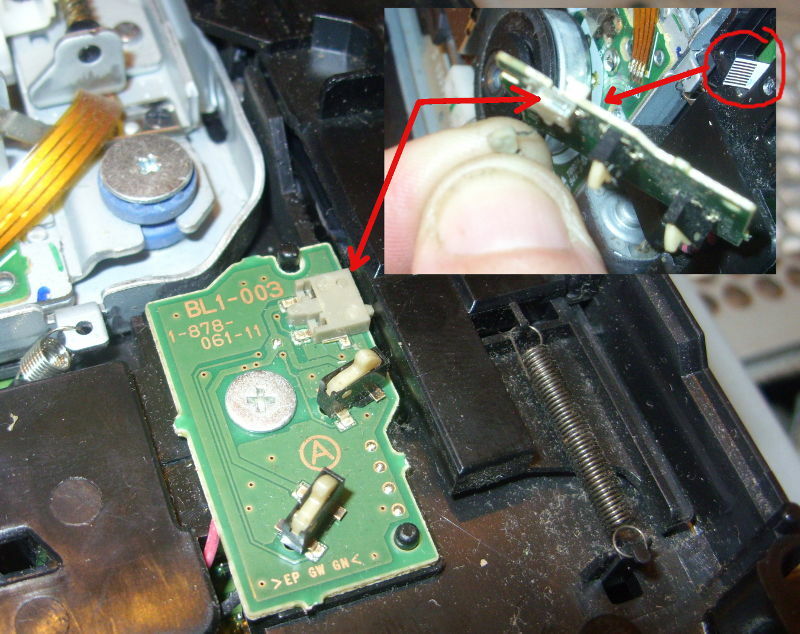 I then popped off the clip to the large cable that goes to the PADs and as I removed it then I got events. This suggested some alignment issue or short i.e. the chip is OK. I unscrewed the PADs metal plate – I removed the copper shield cable (it is glued at the PAD plate end) and had a look. Nothing really to see. It has the 12 square sections that are the sensor elements on plastic film and a big rubber molding for the PAD buttons. No obvious damage. I then did something weird but I wanted to see how the pads sensor elements were constructed as it looked just like the internals of a some kinds of PC keyboards (they have a similar looking plastic film and flexible PCB though the nanoPAD uses Force Sensing Resistors); I peeled back the top layer of plastic that was over the first two buttons – JUST the first two buttons and peeled it back so that I didn’t crease the plastic. It has a lot of glue holding it down at the start and I wondered if this could be some issue but it peeled back OK (bit of force needed) and exposed the first two PAD elements (i.e. the ones closest to the X-Y controller). I then smoothed the plastic film back into place and plugged the PAD cable back into the PCB. It is velocity sensitive and I correctly got events on all PADs with a very light touch yielding say a velocity value of 25 and a bash yielding a velocity of the maximum of 127. I hit them very hard with fingers and very light and they all seemed to be the same sensitivity. I re-assembled; PAD metal frame screwed back, pushed back copper shield onto PAD metal frame, screwed case back on and added rubber feet into place. Still worked. I was very pleased. I could not see what the heck was actually really wrong in the end though I had cleared the fault. Maybe that glue was holding in moisture from manufacture ? Who knows as the problem is now gone and it doesn’t seem to be coming back for my unit yet. I’d looked around for fixes to the Korg nanoPAD and I saw a number of people with the PADs failing even after light (or in my case practically no) use. So I suspect a manufacturing defect and as far as I can see Korg seem happy to replace the units if you report this in warranty period so there are no real tears here except loss of your time. It could be that the fix I described above i.e. peeling back that top layer of the plastic film on the start of the PAD sensor assembly works for you too and there is no harm in trying this if you have a broken unit out of warranty.